Thinking about boots. It was cold on the bike path yesterday when we were walking Daisy. Jogged a memory that I needed new boots this year. Not the high, leather version. The warm version. The walking the dog on a snowy trail in the woods version. So conscious of shutting things down and moving inside for the coming season. We’re like the squirrels and chipmunks scampering around out there gathering supplies. The boat is covered. The chimney flues have been cleaned. The screens are off the windows, and the glass panel has replaced the screen on the front door. The exterior windows have been washed, and we’re on the schedule for gutter cleaning. The lawn irrigation system was shut down yesterday, and the outside water shut off. 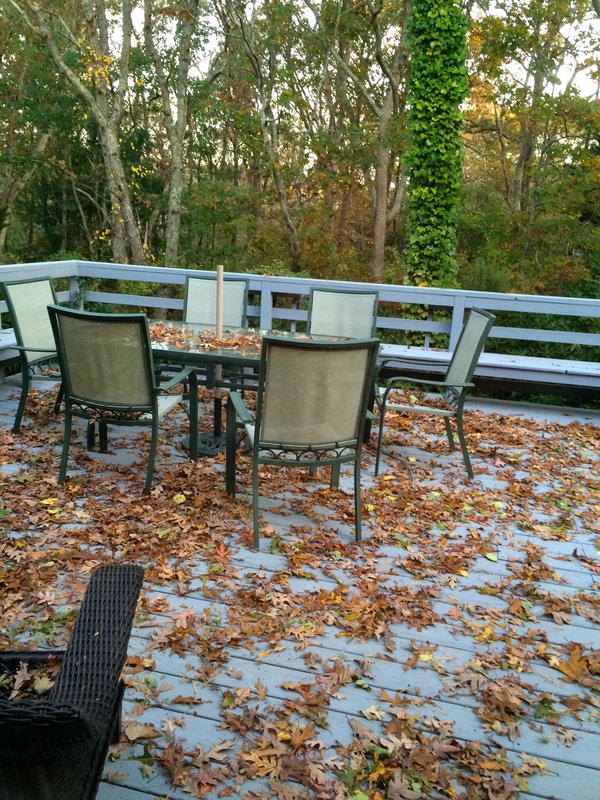 Glancing out the windows of the French doors, I see deck furniture buried under fallen leaves. The umbrella has been removed, but the rest of the space looks abandoned. Maybe because it has been. The French doors remain closed now. All of this could be sad, but it isn’t somehow. I like the fact that seasons and focus and activities change. New England keeps us in a perpetual state of anticipation. As for today, we need to get out there and rake some leaves and move summer furniture to its winter location.